The side view on the left is from Digits, a 2008 solo exhibition at Alfedena Gallery, Chicago,photographed by James Prinz www.jamesprinzphotography.com/James_Pri? It was hung on a clean white gallery wall with good gallery lighting, next to a wall of windows during daytime so this image represents mixed lighting. 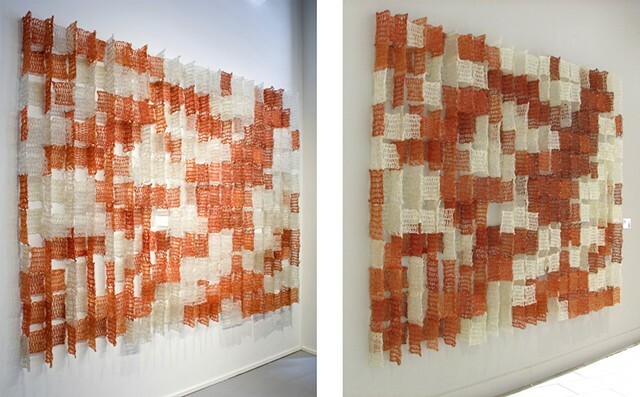 The side view on the right is from Art Loop Open, a 2010 group exhibition at Block 37, a Chicago shopping mall. The work was installed on the second floor, on a greyish putty colored wall, and relied on available interior light. It felt like a completely different piece. The low lighting and colored wall helped to emphasize negative spaces; it made the grid more solid and really focused on the movement and relationships between the white and red patterns.